For those visiting Abruzzo in December who are used to the long drawn out Christmas Markets at home which run from the last weekend of November through to Christmas Eve, you’ll quickly notice a few differences! 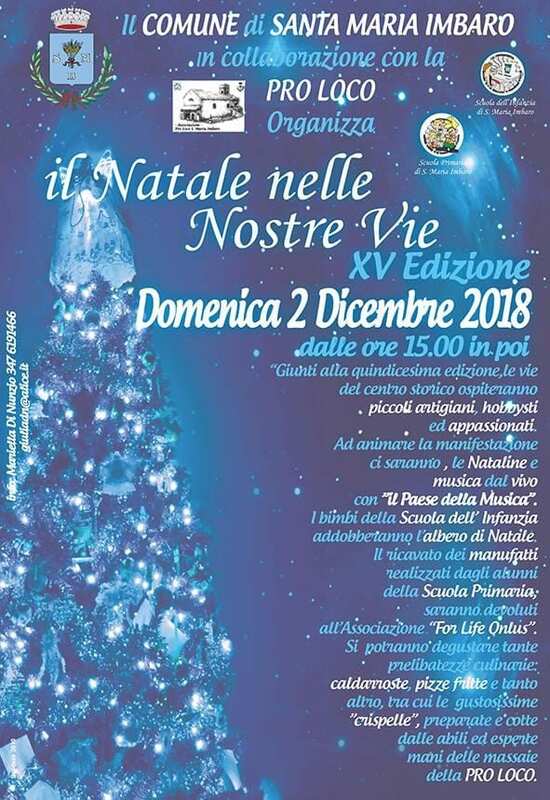 Christmas markets in Abruzzo (mercatini di natale) are beautifully short and sweet, a long weekend at the most, and there is a glut of them around the week of December 8th as their purpose is to celebrate the Feast of the Immaculate Conception which is an Italian national holiday. Their focus isn’t just on purchases for Christmas but the experience, eating and drinking with multiple activities planned around children rather than the simple Meet n Greet of Santa. Small wooden chalets house local craftsman and artisans selling high-quality products that range from christmas decorations to arts and craft interior design accessories, clothes, stationery, handbags and soaps and of course plenty of handmade chocolates. Generally they are hosted in the main piazza of the town’s historic centre, but spill out into the surrounding narrow cobbled streets where a slight chill in the air gives the perfect excuse to browse whilst sampling seasonal pastries that burst with the final Autumn harvest; caggionetti, those fried ravioli-like parcels stuffed with chestnuts and chocolate, orange zest and rum or Montepulciano d’Abruzzo Mostaccioli cookies. For those that prefer something savoury, try a panini filled with fat fegato sausages (pork, liver and orange zest) or porchetta, or just a fritelle, deep-fried bits of dough served hot that are superb alone or stuffed with a slice of prosciutto or bruschetta dribbled with new season olive oil. Aromatic mulled wine, thick hot chocolate will pull you in and one is never enough! Those that have gastro food stands expect to find polenta, mushroom and truffle pasta, bean and bitter winter greens dishes that the region does so well and of course arrosticini will always be on the menu with roasted chestnuts. 2018 Christmas Markets that Caught my Eye. To warm up we suggest visiting the pretty historic centre of this small town. Stalls will be selling creations from local artists as well as cakes and there is local music. Expect to eat fried pizza, chestnuts and pizzelle. 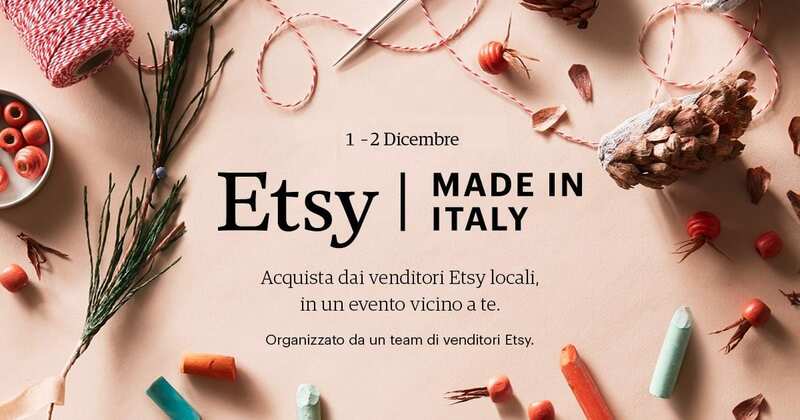 The online craft retailer is sponsoring physical Christmas craft markets for the 2nd year all over Italy. #MadeinItaly is being hosted in 16 Italian cities and includes both Pescara & L’Aquila in Abruzzo. The Pescara market will have 21 exhibitors whose handmade crafts and gifts include jewelry, handbags, children’s’ gifts and accessories. Free craft workshops will be taking place that includes floral decorations for Christmas, readings for children and of course plenty of Christmas food to dip into! The L’Aquila Market has 14 artists. 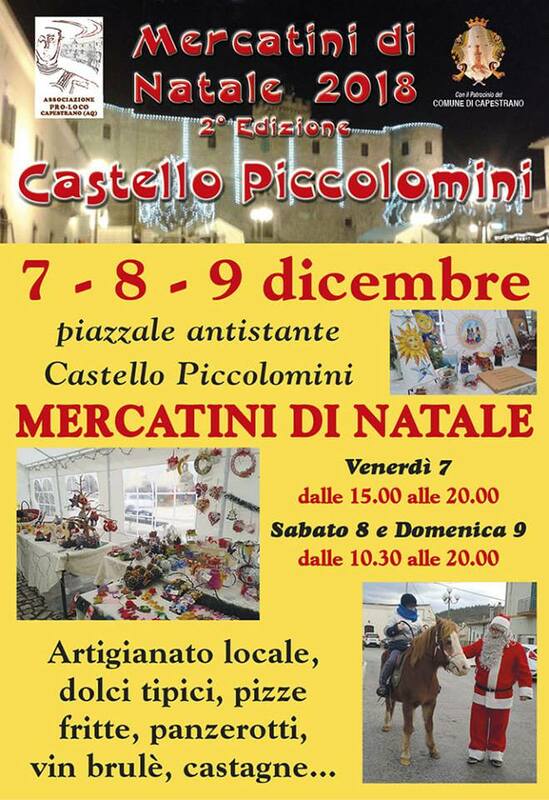 On a visit to the village of Campo di Giove which sits at the southwestern foot of the Majella Mastiff, you’ll find a small town lit up with fairy lights and an extensive craft market that sells strictly hand-made products from wooden chalets by local artists that the Transiberiana Italia train visits as part of its Abruzzo Christmas market experience. Food is a huge consideration at the market and local restaurants work together with the food stands to deliver a delicious locally sourced menu for lunch. There are multiple activities planned for those with little ones with little ones. Over 50 artists will be showing off their jewelry, clothes and works on paper, stone and wood, paintings, sculptures and accessories in Pacentro’s cobbled maze, which is officially listed as one of Abruzzo’s official ‘Most Beautiful Towns’. There will be gourmet local food and wine tastings and the chance for little ones to go on a pony ride to meet Santa and take photos with the elves as well as storytelling. For those interested in street photography there is the chance to join a tour and have an aperitivo together afterwards in Bar de Martinis. 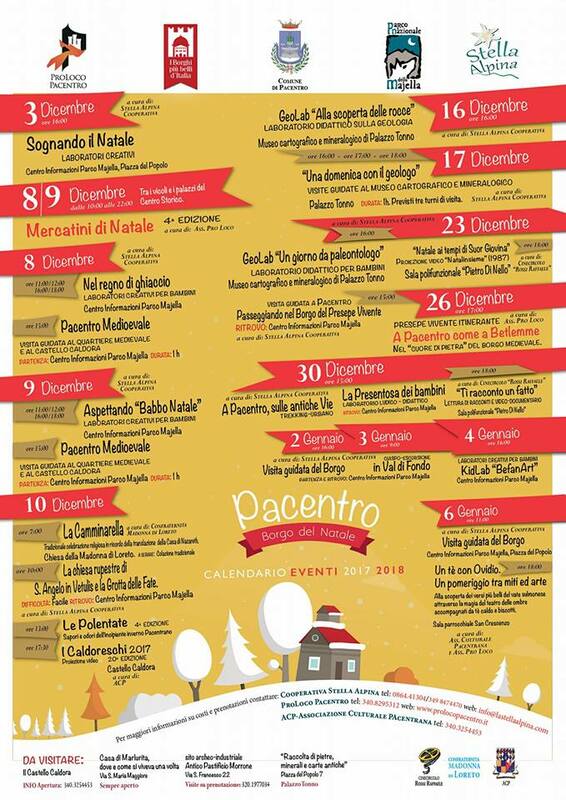 There are some other interesting events in Pacentro throughout December hence showing off their full December calendar. A friendly Christmas Market with craft gift ideas, mulled wine, music and unusually a winter craft beer festival! This is a market that gives equal weight to truffles and wine as to the local artists who sell here. A well-organised chalet style fair with plenty of theatre and performance. The market is housed in the historic centre of this small town that sits between Teramo and the coast. 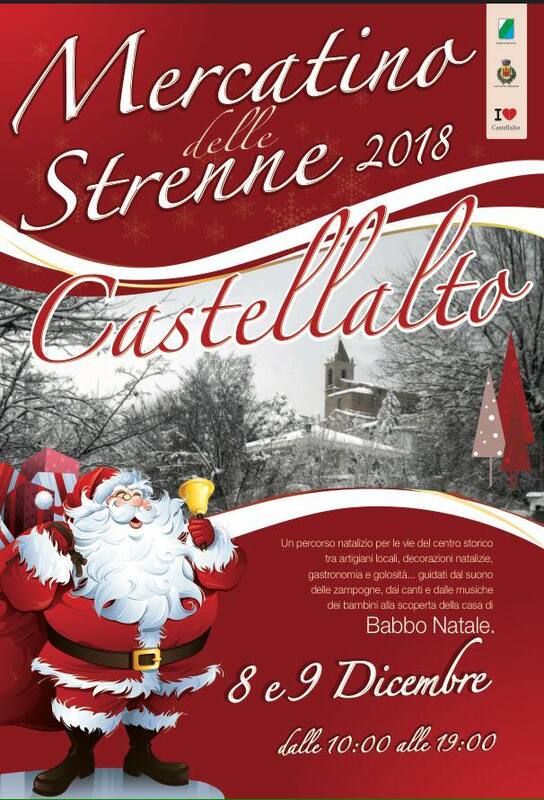 Capestrano is the town to visit if you would enjoy the experience of visiting a Christmas Market hosted in a castle, (Castello Piccolomini). 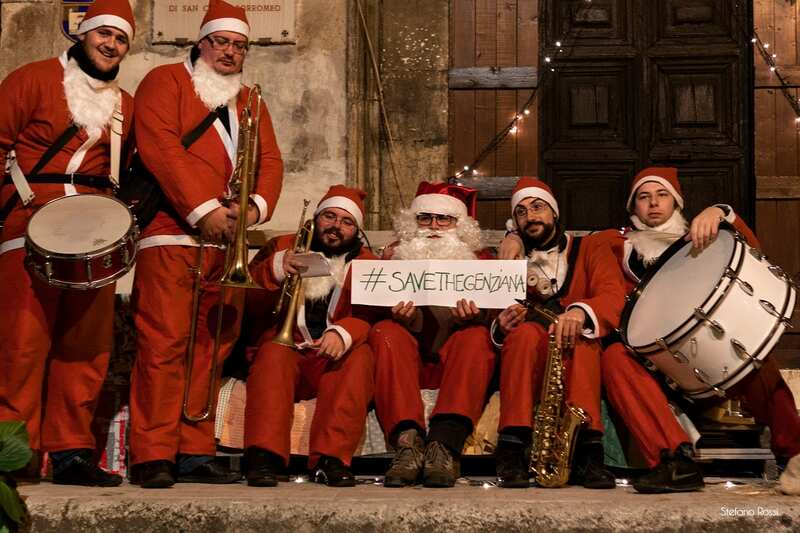 This is is its second effort in hosting a Christmas market and much is made of what you can eat fried pizza, filled turnover savory pastries panzerotti, lots of local cakes whilst drinking good mulled wine. Wish I could be THERE !! !